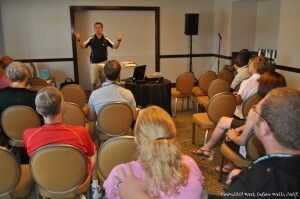 Jim Brown, pastor of Grace Community Church, Goshen, Ind., leads a workshop on Saturday afternoon. 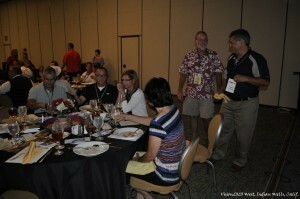 (Saturday, July 28, 2012) with a day full of workshops planned by CE National. Topics included keeping personal priorities, marriage relationships, evangelism for children and teens, connecting with people, prophecy, and more. Speakers included Jim Brown, pastor of Grace Community Church, Goshen, Ind., Jim Custer, former senior pastor of the Grace Brethren Church in Columbus, Ohio; Ed Lewis, executive director of CE National, and many more. The first official conference event was Saturday afternoon, when a well-attended business meeting was held to discuss changes to the constitution of the Fellowship of Grace Brethren Churches. An evening of worship, led by Jeremiah Olson, worship pastor at Grace Community Church, Goshen, Ind., included three-fold communion. Sunday was packed with three meals sponsored by national organizations. 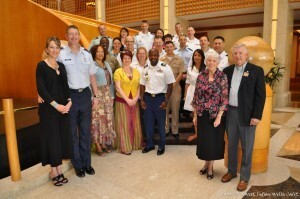 The day began with the Chaplain’s Breakfast, when Grace Brethren military chaplains from around the U.S. were featured. Each had an opportunity to be introduced and to share a bit about their ministry. The meal also included a corporation meeting for the Grace Brethren Investment Foundation, the sponsoring organization for the Eagle Commission, which provides connection and encouragement to the chaplains. Grace College and Seminary held their corporation meeting at noon, including updates from the Winona Lake, Ind., campus. In the morning, John Teevan challenged the conference to integrate justice with ministry, rather than social justice. Later in the day, Keith Minier, pastor of Grace Church in Pickerington, Ohio, spoke on integrated ministries, the theme for the day. “Sometimes in our churches, we have a bad case of ‘do what I say, not what I do,'” he said. Martin Guerna, left, of Dublin, Ohio, and Bob Johnson, of Bellflower, Calif., get in the spirit of the mariachi band and sing along during the Mexican-themed dinner hosted Sunday night by BMH. The day ended with a spirited Mexican-themed dinner hosted by the Brethren Missionary Herald Company. Complete with a mariachi band, the evening also included the annual corporation meeting for BMH and a report of new releases and future plans for BMH. Monday begins a day focused on Leadership Development. GB Canada will host a breakfast, while pastor’s wives will be honored at a luncheon hosted by the Association of Grace Brethren Ministers. Randy Smith, pastor of the Grace Brethren Church in Sebring, Fla., speaks at the morning celebration. The day concludes with the CE National dinner on the mountain. Photos from the week are posted at facebook.com/FGBCWorld. You may also follow the conference in real time on Twitter by searching for the hashtag #vision020west.